Governors, special guests, staff and girls at Leicester High School were delighted to welcome the Lord-Lieutenant of Leicestershire Jennifer, Lady Gretton to the school on Monday 11 October to mark the grand opening of the school’s new extension wing. Lady Gretton arrived to the cheers of the Junior Department girls who lined the drive, waving specially made LHS flags, and she was presented with a posy of flowers by the eldest and youngest members of the Junior Department: Alice Goldsmith (Year 5 aged 9) and Nyah Bhawsar (Year F aged 3). Nyah said: "It was very special to meet such a friendly and very nice lady", whilst Alice concluded: "I shall remember today and presenting the poesy to Lady Gretton for the rest of my life!" Lady Gretton then met Mr Paul Bonnett, Chair of Govenors, Headmistress Mrs Julia Burns, Head Girl Hannah Bristow and Deputy Head Girl Avni Patel, who escorted her while she toured the new extension: six science laboratories, a large art and design studio, a new language computer room and a suite of classrooms. Deputy Head Girl Avni Patel said: "Lady Gretton was extremely friendly and easy to talk to. 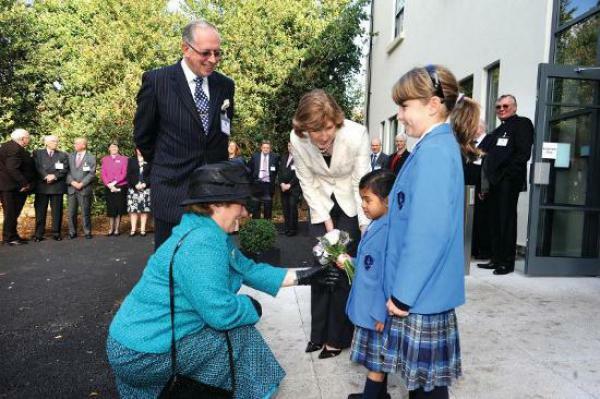 She showed a great interest in everything she saw and everyone she met, and especially in all the new facilities of which we are so proud as a school and which make learning so interesting and such fun. It was a great honour to be able to show her the school at work." Lady Gretton afterwards unveiled a special plaque to warm applause from senior girls gathered in the new courtyard garden, which has recently won a Leicestershire LJCC Craftsmanship Award. To view more images of this event or other events, head on over to our gallery page.